30-story high rise building built in 1972. Basement and floors 1-16 was an active hotel and floors 17-30 were renovated as one, two and four bedroom dormitory units for the Auraria Campus. Encore Electric was involved in the hotel floors 1-3 remodel and the entire dormitory floors 17-30 remodel. Each floor was roughly 11,000 square feet (x17 totally renovated hotel & dormitory floors) = 187,000 total square foot renovation. A new fire alarm upgrade was installed through out the entire building, fire sprinklers, pressurization and smoke control, and many other necessary changes and upgrades with made to code. 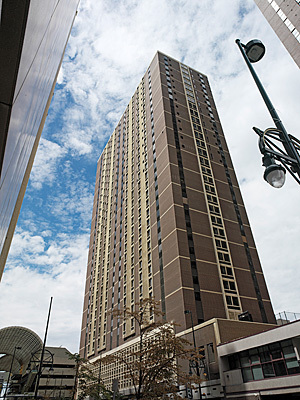 Electrical renovation of the 30 story Executive Tower Inn, and conversion of the upper 15 floors to student housing apartments for the Auraria Campus. The building was originally constructed in 1972, so the electrical systems of the building, and specifically the life safety and emergency power systems were replaced with new systems conforming to current building code requirements. A new generator and new fire pump were installed. The project included implementation of a building-wide pressurization and smoke control system, a new fire alarm system, and modifications to the electrical distribution. A new entry for the student housing was created on street level. Electrical distribution to the upper 15 floors was originally designed for office occupancy. This distribution was modified to accommodate the student housing, utilizing existing bus duct but replacing all other distribution equipment.